What Can I Do About Levaquin Side Effects? I was given a prescription of Levaquin 500MG consisting of 10 pills. At the end of my taking them I suddenly developed sharp pain in my achilles tendon that seriously affected my ability to walk. It has been 3 weeks since my initial dose, and my Right foot & lower leg are swelled and preventing me from walking freely. Both feet are affected but only my right foot and leg are swollen. What is my future? How long will this last? What can I do to shorten these effects? Is this the end of it? P.S. I am a 76 year old male in good health. By default, if you don't do anything in particular, you'll either recover in 12 months or less, or you won't. Those seem to be the two categories. Levaquin Tendonitis Side Effects aren't like normal side effects. Levaquin does a variety of things to your body that shove you into dysfunctional physical health and body operation. Levaquin is out of your body in 3 days, but the damage it causes and the disruption to your body systems can be permanent. Levaquin Tendonitis is NOT normal Tendonitis. They're completely different animals. 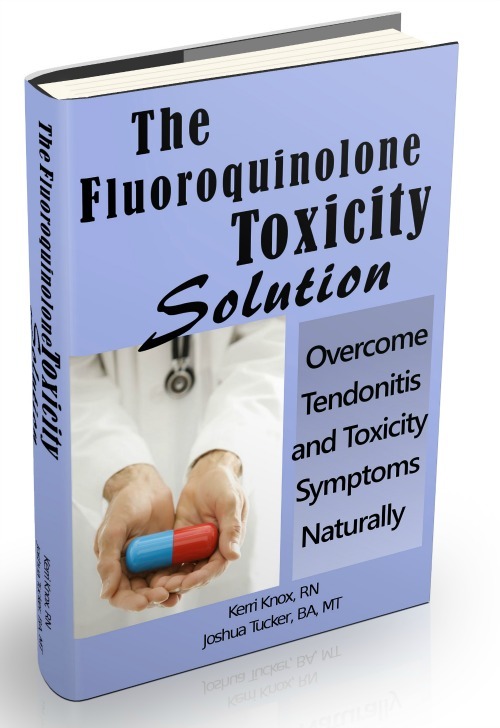 My main suggestion for you is to get The Levaquin Tendonitis Solution ebook. It contains a complete explanation and plan, and you get access to the ebook's forum for questions and answers from Kerri and myself. I don't know what you've read so far about Levaquin, but it's BAD NEWS. Chances are slim that you're just going to naturally recover back to normal. Step on a nail, yes, you heal. Even one dose of Leavquin can cause permanent problem. Having said that, some or all of that problem can be gotten rid of if you go about it the right way. Regardless of if you're 76 or 26, if you want to get better, you HAVE to bolster your body in the right ways and with adequate amounts. Countering Levaquin Side Effects is all about nutrition, specifically, the building blocks your body needs to operate properly and to heal. Comments for What Can I Do About Levaquin Side Effects? Thank you for your recommendation about Magnesium Citrate. It has made all the difference in my Biceps tendonitis. I have been dealing with this for about 8 months and it got better with rest. Couldn't lift my arm it was so bad. After 6 mos only about 70% healed. Then I started taking the Magnesium Citrate. After 2 months, the pain is gone on most days. I still watch what I do with my arm but at least I can lift it now. took 8 500mg levaquin for a common cold. prescribed by doctor. i was already hurting and dealing with pain from tennis elbow and herniated disc. my pain in these joints has increased 10 fold. i immediately quit taken drug. 2 wks. later still in horrible pain. doc says not caused by drug, but after my complaint prescribed another? from what i gather on internet i am right on what has caused my pain levaquin. doc said dont beleive internet i know everything. haha! i see they have a expired limitations lawsuit on this drug. im screwed! from what i gather this could be permanant. going to call fda too. also supposed to have warning label on this drug i bought. get out youre glasses nothing on my warning label. im going to take the magnesium like you advised and pray. i wish i could have seen into the future.this drug levaquin is a poison the govt. is giving us to kill us. i have never encountered anything like this in my 52 years. so whoever reads this dont take my word for it. i will tell you i dont know everything but this pain is real. Your doctor gave you a high powered antibiotic with known and significant side effects for a COMMON COLD? That dr. clearly dos not 'know everything'. He prescribed you another what, exactly? Do you have the prescription box? And it doesn't have a black box warning label in/on it?